(August 5, 2003) accusing political bias. frequently responds to requests by the media for analysis. half of which have dividend income. As a result, the elderly couple Mr.
to $675 as a result of the 2001 and 2003 tax cuts. asserting political bias in the underlying analyses. 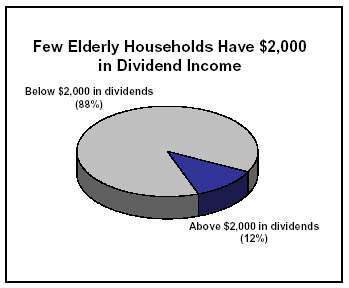 I leave it as an exercise for readers to figure out how Lyon's discussion is consistent with a real world in which the Treasury's "low-income" elderly household has more dividend income than 7 out of 8 elderly households. The point, however, is that the confusing discussion shows the Treasury strategy at work. 1. Never answer the question directly. 2. Offer an elaborate calculation that sounds as if it refutes the accusation that the tax cut mainly favors the wealthy, when in fact it does no such thing. For afficionados: notice how they're still doing the average/median thing. It's clear from what he says that the median dividend for families with the median income is ... 0. Update: I couldn't provide a direct link to the piece from Tax Policy Center, because their web site appears to be down today. But here is a good summary table from Citizens for Tax Justice. By the way, both CTJ and TPC basically have the Treasury model of tax impacts, so their numbers must correspond very closely to what Treasury knows but won't tell us. For more about all this, read Sullivan's angry article in Tax Notes.